NodoEspiral: What is Integral Permaculture? Nice article. Fun to see you weave together the separate stories. I didn’t know Holmgren was into Odum. How do you see the idea of pulsing as changing your approach to design, specifically bridging the gap between pulses? Or do you think there isn’t much we can do as individuals to bridge larger scale pulses? I thought I’d answer here, as my Earth Day blog post. It seems appropriate to honor David Holmgren and Howard T. Odum on Earth Day, so much of this post will be extended excerpts from Holmgren’s 1994 article Energy and Permaculture. Yes, Odum has been a huge influence on Holmgren (perhaps as much or more as his ‘in the flesh’ mentor Bill Mollison). As far back as the first Permaculture book (“Permaculture One”), with Holmgren as lead author, the first footnoted reference was to Howard T. Odum. The work of ecologist Howard Odum provided a theoretical framework and conceptual tool which was critical in the development of the permaculture concept. In the 1970’s there was a flurry of research in this field but it declined along with oil prices in the 1980’s. Odum was one of the leading ecologists who developed a systems approach to the study of human/environment interactions. He uses energy as a currency to compare and quantify the whole spectrum of natural and man-made elements and processes. Analyses ecosystem elements and processes in terms of energy flows, storages. transformations. feedbacks, and sinks. incorporates non-living and living elements of the natural environment. and incorporates human systems and economies as an integral part of the natural world. As I wrote in my post about the Pulse, “Howard Odum was of the opinion that all systems on all scales pulse. Storages gradually accumulate, consumers consume and develop, and eventually decline, and then dispersing materials that will be used in the next pulse.” And if “energy flows, storages, transformations, feedbacks, and sinks” are central to any system, man-made or otherwise, we can see that the peaking of world oil production is going to have a huge effect. So, how does the idea of pulsing change one’s approach to design? First, you’ve got to estimate where you are in the pulsing cycle. In this case meaning, where are we currently on Hubbert’s Curve? And second, if your trajectory on the pulse is changing, then you’ve got to change as well. Time to do a reset on your design. Adapt or die. Many of us believe we are now at or near the peak of this graph. This means two things. One, we don’t have to judge as “wrong” our culture’s past use of oil (at least until we learned of its affect on climate) – Odum told us that all systems maximize use of available power. Two, when you approach and enter the downside of the pulse, you can’t continue operating as if the pulse were continuing to climb upwards. Systems have to adapt to changing circumstances – especially when it’s a change in available energy. Odum’s work shows exactly how and why it is impossible to avoid those rules in any case without the need to resort to moral injunctions. High-energy industrial society is revealed as a quite natural response to fossil fuel abundance but maladapted in every way to a low energy future. …If there is a single most important insight for permaculture from Odum’s work it is that solar energy and its derivatives are our only sustainable source of life. Forestry and agriculture are the primary (and potentially self-supporting) systems of solar energy harvesting available. Technological development will not change this basic fact. It should be possible to design land use systems which approach the solar energy harvesting capacities of natural systems while providing humanity with its needs. This was the original premise of the permaculture concept. While available solar energy may represent some sort of ultimate limit to productivity it is other factors which primarily limit it. 6. contributing useful work to the surrounding environmental systems that helps maintain favorable conditions, e.g.. micro-organisms’ contribution to global climate regulation or mountain forests’ contribution to rainfall. Does the system work to catch and store water and nutrients for as long as possible and as high as possible within its catchment landscape? How does it compare with the performance of pristine natural systems as well as wild and naturally regenerated ones (weeds included)? It is possible for managed productive landscapes to collect and store energy more effectively than pristine systems by the careful use of external, often non-renewable energies. 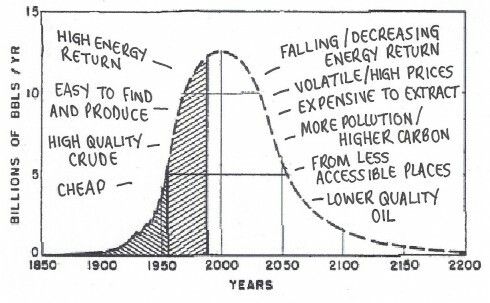 If net energy availability were to increase (through some optimistic/horrific realization of biotechnological dreams or some other current technological fantasy) then The Maximum Power Principle suggests that nothing would stop humanity transforming itself beyond recognition. This would be necessary to absorb and use that energy while pushing back the environmental debt yet again as has been done on a much smaller scale in previous millennia. In such a case, permaculture would be buried in the debris of history, while most existing human culture and values would be swept aside by an avalanche of change. On the other hand, if net energy is declining, as more people have come to realize is the case, then attempts to maintain materialist culture based on growth economics are counterproductive, irrespective of any moral judgments. The permaculture strategy of using existing storages of energy (materials, technology, and information) to build cultivated ecosystems which efficiently harvest solar energy is precisely adaptive. Use resources for their greatest potential use (e.g. electricity for tools and lighting, food scraps for animal feed). Emergist, thanks for the question! I love opportunities to refer to the above Holmgren essay. Perhaps my favorite two essays are Holmgren’s Energy and Permaculture and Odum’s Energy, Ecology, and Economics, published 20 years earlier, in 1974, by Mother Earth News.